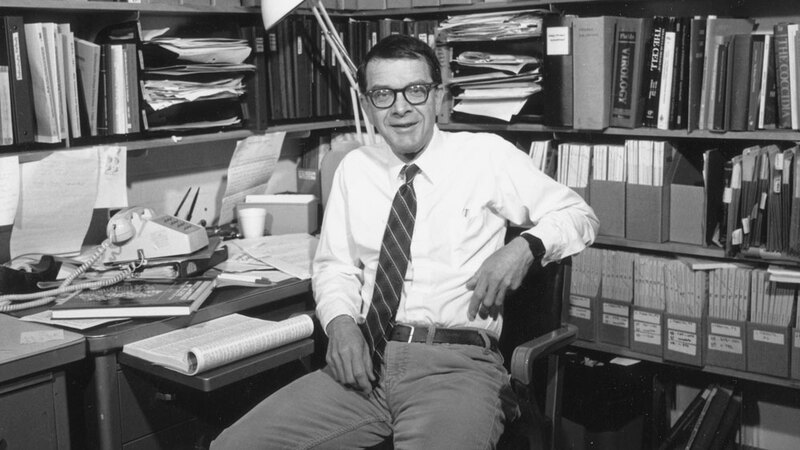 Elmer R. Pfefferkorn, PhD, emeritus professor of microbiology and immunology, and chair of the department from 1980-1992, died on March 25, 2019. He was 87 years old. He is survived by his wife, Lorraine Pfefferkorn, PhD (Guarini ’85), his research partner for 12 years. “Elmer was the quintessential scholar-teacher. He was an esteemed researcher who made important discoveries that led to vaccines to prevent parasite infections. In the classroom, he had a remarkable ability to engage students in both the scientific and humanistic elements of infectious disease and medicine,” says Geisel School of Medicine Dean Duane Compton, PhD. “I will greatly miss his favorite salutation of ‘good day!’"
A five-time winner of Geisel’s top teaching prize presented by each graduating class, former students still recall Pfefferkorn’s ability to make complicated concepts easily understandable and interesting. His enthusiasm, generosity, and mentorship inspired many students to enter the field. But as much as he loved teaching, medical research was his first love. On a Rhodes Scholarship to study medicine at Oxford, he fell hard for research while working in the lab of an eminent bacteriologist who discovered the mechanism of how sulfonamides work against bacteria. His thesis on the genetics of bacteriophages—viruses that infect bacteria—earned him a PhD from Harvard Medical School. Uninterested in competing with fellow scientists for ideas and recognitions, he was quick to share ideas and offer advice with fellow scientists both at Dartmouth and elsewhere. 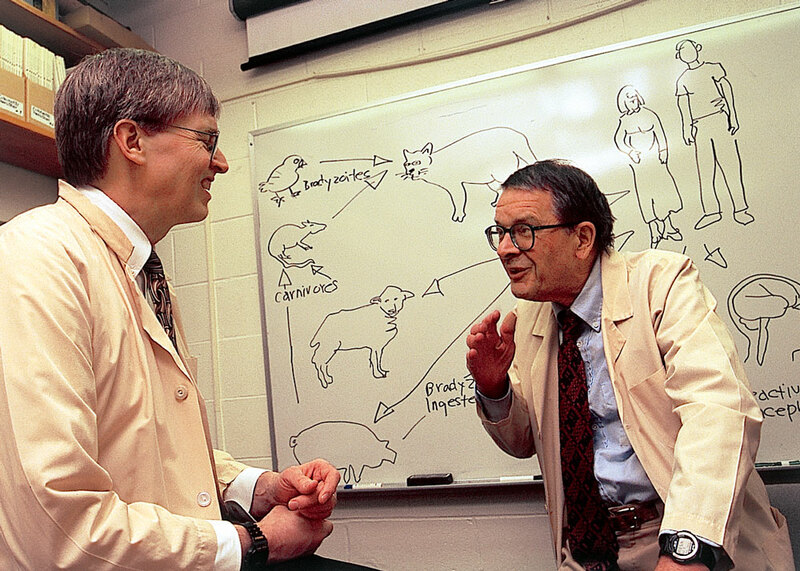 Pfefferkorn is internationally recognized for his contributions to parasitology and virology, particularly for his pioneering research on Toxoplasma gondii, which he had long studied. T. gondii, a protozoan parasite, grows inside cells of mammals, including humans, and birds and is spread through feces. His early research led to the development of a vaccine to prevent the parasite’s growth in cats—blocking one pathway to human infection. Toxoplasmosis can cause neurological damage in unborn children because of its ability to pass through the placenta. An avid reader, Pfefferkorn was also a passionate book collector who amassed an extensive general library in addition to Elizabethan translations in first editions and 19th century books on British Arctic explorations. He once playfully noted one of the reasons he came to Dartmouth was because of his interest in the private collection of Vilhjalmur Stefansson. Pfefferkorn visited the noted Arctic explorer and one-time director of polar studies at Dartmouth in Hanover to talk with him and to see his vast collection of books, photos, and manuscripts on scientific exploration. Stefansson’s collection is now housed in the college’s Baker Library. Paul Guyre, PhD, active emeritus professor of microbiology and immunology, describes Pfefferkorn as “the most incredible scientist, teacher, and inspiring role model one could ever hope to know. He consistently received perfect scores on his NIH grant applications, and to this day I use his seminal 1984 PNAS paper to impress upon new students how important it is to be fastidious and meticulous. Pfefferkorn’s legacy is recognized by the endowed Munck-Pfefferkorn Prize Lecture—named in honor of Geisel School of Medicine luminaries Elmer Pfefferkorn, PhD, and Allan Munck, PhD. Both were outstanding scientists, teachers, and mentors, who inspired new generations of researchers and physicians. And the Elmer R. Pfefferkorn & Allan U. Munck Education and Research Fund Novel and Interactive Grant Initiative was created to support research and education initiatives within the Geisel School of Medicine, particularly to provide significant support for the research initiatives deemed most likely to foster faculty interactions that will lead to novel biomedical advances and have the potential for generating ongoing support of Geisel research. Plans for a memorial service are forthcoming.